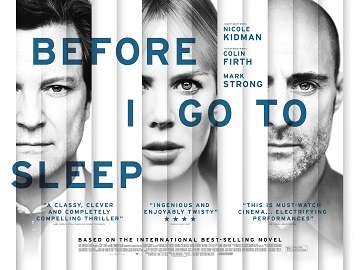 ‘Before I Go To Sleep’ is a tense, twisty thriller that takes its time to get going until delivering an exciting final half hour. Reuniting Colin Firth and Nicole Kidman for their second film this year after disappointing war thriller ‘The Railway Man’, and also starring Mark Strong, the film focuses on a woman who wakes up each morning with her memories wiped after a terrible accident years ago. When we first see Nicole Kidman’s character ‘Christine’, she wakes up in bed with a man she doesn’t recognise (Firth’s Ben, her husband), and he relays the story of her accident and her circumstances. This is corroborated by a phonecall from Dr. Nash (Strong) who has been aiding her, although strangely Ben is unaware of her sessions with Nash. The film is clearly influenced by the excellent ‘Memento’, one of Christopher Nolan’s earliest films, and whilst it lacks the punch and the intrigue of that film, it still makes good use of the memory loss premise. Kidman is strong as the lead, but its Firth and Strong who shine the most, with both giving off a sufficient air of mistrust to suggest everything isn’t as it seems. As Christine starts to remember bits of her past, she starts to uncover the truth and this is when the film starts to come to life. The final half hour is tense, exciting and a little frightening at times, and it’s exhilarating to watch. Unfortunately it’s not matched by the opening hour, which struggles to maintain the momentum of the story and feels like it’s doing a little too much table setting for the grand finale. Overall, this is a solid 90 minute thriller, with strong performances, and it’s worth checking out.